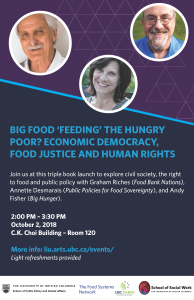 UBC’s Liu Institute for Global Issues is hosting a book launch exploring food rights, civil society, and public policy; featuring Food Bank Nations’ Graham Riches, Public Policies for Food Sovereignty’s Annette Desmarais, and Big Hunger’s Andy Fisher. It will be in 120-1855 West Mall, on October 2, 2018, 2:00-3:00. Read more or RSVP.